Following a somewhat underwhelming 2018 I decided to make a few small changes to my stock screen’s metrics and my defensive value investment strategy. At below average prices: where the combination of dividend yield, dividend growth and capital appreciation are likely to give me an annualised return of 10% or more and a decent dividend yield as well. Note: If you’re not familiar with my approach then you should probably read this short one-page overview, or this 5,000-word blog post, or my fairly lengthy 300-page book, The Defensive Value Investor. You can also download the latest version of the Company Analysis Spreadsheet (XLS) which will calculate these new metrics for you. This change affects all of my stock screen’s metrics, including Growth Rate, Growth Quality, Profitability and the Debt, Pension and Capex Ratios. The Growth Quality metric counted how often adjusted earnings increased in the last ten years, and how often they covered the dividend. It will now use reported earnings instead. The Net Profitability metric measured ten-year average returns on capital employed, using adjusted earnings for the returns figure. It will now use reported earnings instead. I decided to use adjusted earnings way back in 2011 because they exclude one-off ‘exceptional’ income or expense items in an attempt to measure a company’s ‘core’ recurring earnings. I liked the idea of focusing on a company’s core business, and I also liked the fact that adjusted earnings tend to be less volatile than reported earnings, which makes the task of measuring their long-term growth a lot easier. However, over the years I’ve found that adjusted earnings frequently give an excessively optimistic view of a company’s progress. That’s because the excluded ‘exceptional’ items are almost always expenses rather than income. One recent example of the gap between adjusted and reported earnings is N Brown, the size 20+ and age 50+ clothing retailer. 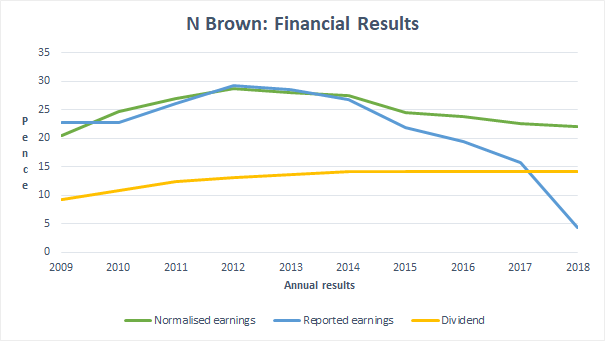 N Brown has been in my model portfolio for a few years and recently cut its dividend by 50%, despite the dividend being comfortably covered by adjusted earnings. As you can see from the chart, normalised earnings (a standardised version of adjusted earnings published by SharePad, Morningstar and many others) have been about flat over the last decade, and have always covered the dividend. But the story for reported earnings is completely different. They have slowly but consistently declined since 2012, accelerating to a collapse of reported earnings in 2018. Why were normalised earnings so bad at conveying the company’s decline over the last few years? While it may be helpful to exclude these items in order to gain a better view of a company’s core business (selling clothing in N Brown’s case), I now think completely ignoring these ‘exceptional’ expenses is a mistake. While they may be ‘exceptional’, these expenses still exist and still decrease the amount of profit generated by the company. Adjusting them away may give a clearer picture of a company’s ‘core’ business, but they give a worse picture of the whole business. And that’s why all my metrics will use reported earnings from now on. This focus on reported earnings will also replace my recently announced switch to using free cash flows. Although I like the idea of valuing companies using free cash flow, I’m still not completely onboard with that approach as it can be quite restrictive. For example, high growth companies tend to produce poor free cash flows, but that doesn’t make them bad companies or bad investments if they’re purchased at a good price. I also felt the switch to free cash flow-based investing would require some large changes to my stock screen and company analysis process and I’m not a fan of radical change. So instead I’ll be making the smaller switch to reported earnings. But I’m not ignoring cash flows completely; I’ll be using some new and updated ratios to track how well earnings are turning into cash, which I’ll outline in a future post. Part two of this series will follow shortly and will outline a couple of changes to my Growth Rate metric. By reported earnings do you mean diluted earnings? I use data from ShareScope or SharePad, both of which publish diluted EPS numbers. However, for most of the companies I’m interested in (established large and mid-cap companies) the difference between basic (non-diluted) and diluted EPS is minimal, so I don’t think it matters all that much, at least most of the time.